On the eve of their impending release, astonishing ratings are sparking a great deal of excitement for the latest Bordeaux vintage. This seems like the ideal moment to publish a report presenting my comments and notes, previously unpublished, for 2014 Bordeaux and my recent evaluations of 2015 Bordeaux. Each vintage was tasted in New York in 2017 and 2018, respectively, at the Union des Grands Crus (UGC) events. Presenting these two vintages together may help bring perspective to the discussion. These two years have been perceived very differently. 2014 was and is seen as a good vintage of generally fresh, moderately concentrated red wines and vivacious dry whites. 2015, on the other hand, was announced with a great deal of fanfare as a uniformly outstanding year across the region, an assessment now being amplified by breathtaking scores for some 2015s. Let us recall that the 2014 growing season was compromised by cold weather at flowering, a chilly July and a cold, gray August. However, September and October were very favorable, with higher temperatures, low rainfall and elevated sun hours compared to the 1981-2010 averages. Harvesting took place in ideal conditions. The Cabernets performed well as did the white grapes, which profited from the cool summer and possess higher acidities at a typical pH. Of note is that the sugar ripeness of Cabernet Sauvignon in 2014 was on par with 2009 and 2010, two acknowledged great years. Acidities across the board were higher in 2014 than 2015. On paper, the conditions for an outstanding vintage were all met in 2015. Summer was sunnier and drier than the norm, except for rains around the 7th, 12th and 22nd of August. 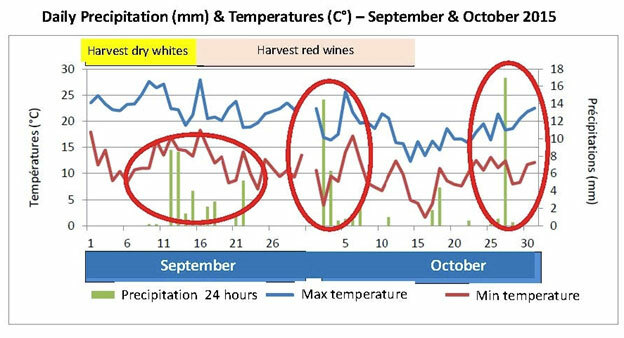 September and October recorded particularly low precipitation in total, yet there was ill-timed rainfall in mid-September and again at the very beginning and end of October. The impact of these storms in the three months was felt in the Northern Médoc, perhaps more than first recognized. The last two critical months also witnessed lower temperatures than the average for the preceding three decades. 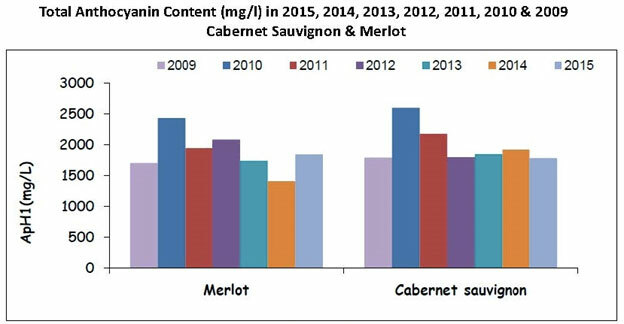 Sugars across varieties, and in Merlot above all, were higher in 2015 than 2014; indeed, the fact they surpassed 2010 and 2009 levels set the stage for high expectations. Interestingly, anthocyanin content was not unusually high in 2015 and complete phenolic maturity varied as well. These data are all clues to the personalities of the final product and the irregular outcomes. Now that the 2015s have completed their élevage, it may come as a surprise that enthusiasm for this vintage needs to be tempered; clearly, some appellations and properties performed to a high standard while others are disappointing. This reality has not yet set in, and many estates, merchants and writers are still trumpeting the uniform greatness of 2015. Importers and retailers who have taken a significant position in the 2015s clearly have a vested interest in this message. This brings us back to the present. Stephen Brook, an acknowledged Bordeaux expert, writes in Decanter (January 2018) in an article about the 2015s he tasted at the London UGC event in late 2017, “…at this stage it seems over-optimistic to acclaim 2015 as a truly great year. It doesn’t have the opulence of 2009, nor the thrilling rigour of 2010.” Brook goes on to say: “Nor is it clear that this is a vintage for long cellaring.” Based on the wines I have tasted to date, I completely concur. I would add that the 2015s lack the impressive substance, structure and aging potential of the 2005s. There are many surprisingly delicate and accessible examples, and the reds are in general immediately flattering and seductive. In 2015, it appears there is a significant gap between the very top châteaux and the rest; that’s not unusual in itself even if the contrast is dramatic in this vintage. The full story is more complicated since a number of celebrated properties as well as modest ones, in certain sectors, did not produce memorable wines and do not merit scores equal to (or even higher than) those handed out in 2005, 2009 or 2010. While I still have many 2015s to taste, my first impression is that there seems to be inconsistent quality horizontally, across districts, as well as vertically, up and down the Bordeaux hierarchy. But the style of the vintage is beguiling: the wines are incredibly easy to taste at this early stage. This has generated a sense of euphoria which pushes up ratings and benefits underachievers. In 2015, the Right Bank seems to have been especially favored, and Pessac-Léognan as well, but the Médoc is patchy. Many wines show dilution. Margaux, of the glamorous appellations, can claim numerous successes. But in my opinion there are 2014s in Saint-Julien and Pauillac which have more concentration and structure than their soft, tender 2015 counterparts. Moreover, their cool, fresh taste profiles more closely conform to the expectations of Bordeaux enthusiasts. Many 2014s, as you will see from my assessments in early 2017, will offer satisfying drinking over the mid-term. My perspective and judgment stem not only from my experience as an importer of Bordeaux wines, but also from six intensive years managing the U.S. affiliate of a Bordeaux merchant. During this more recent period, I tasted wines from barrel, at the end of élevage, just after bottling, and again later. Also, it so happens that this intimate involvement with Bordeaux coincided with three unquestionably outstanding vintages: 2005, 2009 and 2010. This discussion is a reminder that it is necessary to delve deeply into the particularities of the growing season to find explanations for the character of any given vintage. The final judgment, however, always depends on the ultimate result – the wine itself, after barrel maturation, assessed without prejudice for or against. The following charts and graphs present in detail some of the specific data discussed above. They have been adapted from Le millésime 2015 à Bordeaux by Laurence Geny and Denis Dubourdieu of the Institut des Sciences de la Vigne et du Vin, Université de Bordeaux. In the tasting notes below, the 2014s are in red and the 2015s are in blue. Pale yellow gold. Very clean with excellent integration. Piquant, inflected white and citrus pith with nuances of yellow fruit. Clean, direct palate, medium weight. Penetrating and finely balanced, with hidden flesh at the center. Opens slowly. Chiseled, bone-dry finale. Moderately dense blackish red with purple rim. Herbal and green overtones in the aroma at first, giving way to dark red fruit. There is clarity and dark fruits on the palate. Firm, dry and a touch bitter, although typical of type. Transparent gold. Very fine and subtle nose with youthful restraint. Multifaceted aromatics characterized by white fruit, citrus, yellow fruit and a delicate vanilla accent. Focused and precise in its taste, though held back and very young. Taut and tense with elevated acidity. A typical Carbonnieux in an excellent vintage for white. Moderately dense plus black red with purple rim. Lifted albeit youthful aromatics suggesting dark fruits and herbs. Clean, medium-bodied and of moderate concentration. Dry conclusion with a degree of bitterness. Very pale yellow gold. Inviting, scented nose of mature yellow fruit and ripe citrus enhanced by attractive oak. The palate is lovely and polished with a long line. Medium weight. Very youthful and elegant. Skillful use of oak. A refreshing saline note at the end. Moderate density, dark red with purple at rim. The aroma is medium concentrated and exhibits red fruit and integrated oak. In the mouth, this 2014 red is clean, fresh and balanced. Medium-bodied, it has persistence and is defined by acidity and tannin that is slightly bitter. Very pale yellow gold. Restrained, youthful aroma, clean but lacking a measure of concentration and intensity. The palate offers a transparent feel and is light- to medium-bodied. Bone-dry, etched backbone and lingering white fruit and citrus highlights. Nearly dense dark red with purple rim. Dark fruit to the nose with green notes. Only medium concentration and short of complete maturity. A bit forced. Needs more finesse and less greenness. A dark red of moderate density, with a clear purple rim. Very fine nose with notable purity and healthy, mature red fruit. On the palate, the wine delivers precision, focus and transparency along with skillfully judged oak. Not fleshy or viscous. Medium weight. Dry but not severe. Haut-Bailly is always a cut above. Moderately dense red-purple. Very fine, focused and inflected aromatics of red fruits. The palate displays beautiful integration and harmony at this early stage. Medium-bodied with an expressive, complex perfume in the mouth. Exceptionally fine structure of delicately pointed acidity and fine-grained tannin. Promising length and lingering tension. A model of finesse. Very pale gold. Very clean aroma showing grapefruit and wool notes and excellent intensity. The taste is similarly taut and tense, transparend and medium-bodied. Youthful high-toned finish with enticing saltiness. Dark red with purple rim, moderately dense. Very clean, fresh. Attractively scented youthful red fruits and berries. Finely constructed, light to medium weight. Dry, balanced, cool. Very pale yellow gold. Beautiful, multidimensional and transparent aroma of citrus pith, white fruits, fresh herbs and lanolin. The palate as well boasts clarity and pronounced aromatics. Gains in intensity in a promising youthful finish. Very fine and elegant. Moderately dense very dark red with purple rim. The nose indicate medium concentration and dark fruits. Clean, restrained, somewhat one-dimensional in its taste. Lacks energy. Yellow gold. Overtly ripe aroma of mango and pineapple with a complement of new oak. Ripe, rich taste though surprisingly balanced by ripe acidity. Medium- to full-bodied. Mouth-coating aftertaste of ripe yellow fruit. Highly individual style. Light gold. Rich, complex nose with expressive yellow and white fruits and noteworthy complexity. The palate is rich but balanced, deftly marrying a mouth-coating quality with a sense of finesse. Fine ripe acidity. Persistence and purity. Not at all exaggerated like the 2014. Dense dark red with purple rim of moderate density. Clean, restrained, fragrant nose of mature red fruit. Clean, harmonious palate, medium weight plus. Expressive and appealing, with balanced fruit and oak integration, ending with a fine structure. Faintly bitter at the end. The extra measure of fruit maturity benefits this 2014. Moderately dense very dark red with purple rim. Fresh, multidimensional aroma of small red fruits, fresh tobacco and an herbal note. The lovely palate is pure, enveloping and polished, with a sweet undertone and carefully judged oak. Perfectly offset by a very fine structure of acidity and fine-grained tannin. Refined and elegant. Very pale gold. Youthful aroma showing controlled richness. Multifaceted white and yellow fruits with enhancing herbal accents. Polished and composed in the mouth. Medium-bodied plus. Shows youthful reserve. Lovely, high-toned finish. Classy. Straw gold. Ultraclean, exceptionally pure nose with very fine citrus inflections. Pure, harmonious taste with perfectly ripe yellow and white fruits. Remarkably long, sensational finish with impressive youthful complexity. Nearly dense very dark red with purple rim. Clean, young, restrained nose of dark fruit and well-matched oak. The palate offers maturity and tenderness. Medium weight plus, with an underlying fruit sweetness. Embedded structure and delicate tension. Slight bitterness. Nearly dense very dark purple red. A muted aroma of beautiful, youthful ripe dark fruit with considerable reserve. The palate follows, restrained and high class. Medium weight and composed with precision and intensity, ending with a fine, ripe structure. Pale straw gold. The expressive, enticingly complex aroma offers lanolin, grapefruit pith and ripe lemon peel. The palate boasts terrific precision and equilibrium together with underlying fruit maturity. Already very long with a fine spine of ripe acidity. Very classy and individual. Moderately dense dark red with purple rim. Very clean nose of mature, fragrant red fruit and carefully integrated oak. The palate conveys a clean impression and a lovely, restrained presence of medium weight. This 2014 is composed and has a fine structure. Suggestion of youthful bitterness in the final taste. Nearly moderately dense dark red with purple at the rim. Nuanced red fruits in the perfumed aroma. Very delicate, almost ethereal presence on the palate. Elegant and long and again perfumed in the finish with a delicate structure. Almost Burgundian in profile (Beaune premier cru?). Moderately dense dark red with clear purple rim. Very clean, fine nose showing lovely integration and intensity, with maturity and restraint. The taste delivers purity and class. Harmonious and particularly well-integrated. Medium weight plus. Tension and reserve in the undeveloped finish. A very successful 2014. Moderately dense crimson with purple rim. Very much in reserve aromatically with masked red fruit and a delicate creaminess. Graceful, lacy and medium-bodied. Very long and promising finish with high-toned fruit, fine acidity and fine tannins. A pretty if atypical expression of Pomerol. Moderately dense very dark red with clear purple rim. Reserved dark fruit and smoky oak to the nose. Ripe, seductive and textured in the mouth with a suggestion of sweetness. Ripe acidity and fine-grained tannin together with complementary oak in the conclusion. Very dark red with purple rim, moderately dense plus. Attractive scent of mature red and dark fruit combined with toasted oak. Ripe, chewy and layered. Medium-bodied plus. The wine is wrapped up by a ripe structure of acidity and gripping tannin. Dark red with purple rim, moderate density. Very clean, youthful fragrance of red fruits. Medium concentration. In the mouth, this 2014 is clean and charming, light- to medium-bodied. Poised and elegant. Moderately dense plus very dark red with a purple rim. The youthful aroma is warm and generous, blending ripe dark fruit, smoky oak and herbal highlights. The palate shows fruit maturity but is reserved. Ample and fleshy at the center and balanced by a ripe structure and complementary new oak. A highly successful example of the Right Bank in 2015. Dark red with purple at rim, of moderate density. Very clean, expressive nose displaying a red fruit fragrance. Quite accessible at this stage. Medium concentration. Clean, fresh taste profile, medium-bodied and well-balanced. Dry but not aggressive. A skillfully handled 2014 on the Right Bank. Moderately dense garnet-red with purple rim. Reserved nose concealing mature red fruit and carefully married oak. Focused taste with a beautifully polished center. Precisely calibrated acidity. The wine concludes with a soft, smooth feel but is non-expressive. Slightly bitter at the end. Moderately dense red with clear purple edge. Attractive, lifted red fruit and high-caliber oak. Clean, medium-bodied and well-balanced. Has a degree of depth and charm. Moderately dense plus dark red with purple. Generous, forthcoming aroma of ripe dark fruit with promising youthful complexity. On the palate, the wine is ripe and composed as well as fresh and balanced. The structure is ripe and embedded. There is budding length and a lingering fruit scent in the final taste. Dark red of moderate density with clear purple rim. Clean but not concentrated nose marrying delicate red fruit and oak notes. Light to medium-bodied, charming and precocious. Fine, delicate structure. Moderately dense plus very dark red with purple. Penetrating, multifaceted aroma joining red fruits and berries, a note of vanilla, and noteworthy intensity. Closed on attack, yet the wine possesses concentration and equilibrium. Combines flesh and structure and a subtle undeveloped finish. This should have a longer life than many 2015s. Moderately dense red with purple at edge. Inviting and expressive youthful aroma of red fruit and oak. La Couspaude is focused and precise in its taste as well as reserved. Medium-bodied. Pointed acidity and fine tannins. Fine equilibrium and elegance. Moderately dense red with purple at edge. Muted nose with restrained dark red fruit and black berries. The palate is also reserved but has evident maturity, flesh and generosity together with oak. Balanced and slow to open. Ripe, integrated backbone. Very dark red, moderately dense plus, with a purple rim. Focused and highly concentrated nose of youthful, complex red fruits and berries with an overlay of new oak. The palate is mostly closed with hidden dark red fruit and an oak imprint. Fresh, mouth-watering acidity and powerful but ripe tannins. A large-scaled wine. A surprise addition to the UGC tasting. Dense purple-red, black center. Concentrated, multifaceted aroma exhibiting red and dark fruit, white mint, integrated wood and spice. Focused and precise in its taste. Beautiful fruit qualities and nascent complexity. Finely calibrated structure of elegant acidity and medium tannins. Already long and complex. Oak surfaces in the conclusion. Justifies its elevation to Premier Grand Cru Classé. Dark red, short of moderately dense, with purple rim. The nose is open and warm with delicate red fruits and leaf. The palate is very accessible for this stage, diffuse and just medium weight. Lacks concentration. Early drinking. Moderately dense plus very dark red with purple at edge. Relatively open aroma of ripe red fruit with green accents. Ripe in its taste with an underlying sweetness. Medium-bodied with accessibility and immediate charm. Ripe structure. Will develop early. Very dark red, moderately dense, with a purple rim. Open, forthcoming aroma of red fruits. Ripe fruit flavors but diffuse and fairly simple. Forward early drinker. Very dark red, moderately dense plus, with purple rim. Reserved nose concealing dark fruit and cherry compote. In the mouth, the wine is soft, tender and medium weight, offering a lovely sensuality and polished feel. Particularly well-balanced with an elegant structure. Persistent youthful finish. A stellar result from this estate and a textbook Margaux. Moderately dense very dark red with purple at rim. Very attractive aromatic expression of mature red fruit and spice. Soft attack. Lacks center. Fine pointed acidity and soft tannin. Well-balanced, offering charm and elegance for the near- to mid-term. Very dark red, moderately dense. Open aroma of low to medium concentration showing red fruit and green leaf highlights. This 2014’s taste is forward and medium weight, with delicate balancing acidity and tannin. To drink in the near term. Nearly moderately dense dark red with purple rim. Delicate, nuanced aroma of red fruit and leaf. The palate is tender, just medium weight, relatively open and lasting. Lacks concentration but has finesse. Dark red, nearly moderately dense, with a thin purple edge. The nose is restrained, with subtle youthful red fruit and carefully calibrated oak. In the mouth, Giscours is fresh, poised and attractive, revealing sound fruit maturity. Clean, dry. Appealing and classically styled Margaux. Moderately dense dark red with thin purple rim. Rather non-expressive with masked red fruit and a note of vanilla. Graceful presence on the palate though rather light. Finely constructed with a tender backbone. Dark red of moderate density with purple. Reserved and youthful with mature dark red fruit and smoky oak highlights. The palate is surprisingly assertive with intensity and early length. Polished mouth-feel and embedded ripe acidity and tannin. Moderately dense very dark red with clear purple edge. High-toned nose with leafy and red fruit highlights. The palate follows the aroma and is medium-bodied and soft with underlying fruit and a ripe structure. Lacks some purity. Off bottle? Dark red, moderately dense, with a clear purple rim. Clean nose, which displays dark red fruit, a green accent and a note of toasted oak. The palate is clean and especially well-balanced. The taste shows more substance and expression than the average for this vintage. Fresh and poised, with a bitter note at the end which may dissipate with bottle aging. Moderately dense dark red with thin purple rim. Ripe, scented red and small red fruits to the nose with an attractive creaminess. Ripe, harmonious palate, medium weight and well-balanced. Soft final impression. Apppealing wine for the near- to mid-term. Dark red of moderate density with purple rim. Very clean aroma with lovely purity and focus. Healthy, mature red fruits and high-quality, artfully judged oak. The palate is fine, nuanced and elegant. Has grace and a polished center. Very fine, precisely calibrated structure. A high-class wine and noteworthy achievement in 2014. Moderately dense very dark red with thin purple rim. Beautiful, pure aroma blending nuanced red fruit, a delicate minty highlight and ideally matched oak. On the palate, this 2015 is very finely constituted, delicate and reserved. Medium weight. Elegant but non-expressive finish. This 2015 actually needs time to reveal all its qualities. Just short of moderate color density, red with purple at rim. Relatively open, clean nose of scented red fruits without notable concentration. Clean, well-balanced in the mouth. Poised, medium weight. Has finesse and tension in the concluding impression. Has early appeal. Moderately dense plus red with black center. Attractive if discreet nose of mature red and dark fruit with a leafy note. The palate shows restrained, youthful fruit and is medium-bodied plus. Warm with sweet fruit ripeness and a measure of richness. Ripe acidity and tannin. Pleasing and relatively forward. Dark red of moderate density with purple. Focused nose of healthy dark red fruit with spice inflections. Fresh, poised and medium weight. Reserved in its expression. Notable precision and nearly etched frame. Appealing and will gain from mid-term aging. Just short of moderately dense dark red-purple. Ripe aromatics with expressive red and dark fruit. The taste exhibits comparable ripeness and has a mouth-coating quality. Medium-bodied plus. Warm and textured aftertaste with pointed acidity and ripe tannin. Moderately dense red, black center, with purple at rim. The aroma is characterized by a fragrant mélange of dark red and black fruit and subtly smoky oak. On the palate, Branaire delivers a clean impression with marked freshness. Medium weight plus, with underlying flesh. Elevated acidity provides tension and framing. Classic young Saint-Julien. Uncharacteristically light dark red. Lacks concentration and shows a leafy aroma. The palate is open and weak. Far below the usual standard for this château. 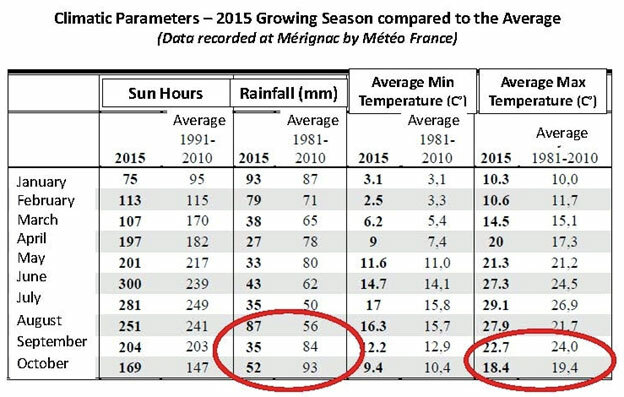 Reveals the inconsistency of the 2015 vintage in this part of the Médoc. Moderately dense dark red with purple rim. Fragrant, leafy aroma with red fruits. Poised and medium-bodied. Attractively integrated with masked maturity. Clean, fresh and well-balanced. Nearly moderate density, red with clear purple rim. Aromatically, Gruaud is clean and transparent, with delicate red fruits. Just medium weight, the taste is clean and fresh. Dark red short of moderate color density. The nose is muted, hiding red fruit and leaf. On the palate, this 2015 is tender and gentle, on the lighter side. Remarkably forward with delicate acidity and soft, subtle tannin. Moderately dense dark red with a purple rim. Clean, nuanced aroma of black fruit and a leafy highlight. This 2014s taste profile is particularly fresh and focused, with noteworthy tension and definition. Imparts an etched finale. May merit its higher score after bottle maturation. Dark red, short of moderately dense. Restrained aromatic expression with muted red fruit and oak spice. Open in its taste, verging on diffuse. Balanced, but misses concentration and intensity. Dark red with purple rim, just medium density. The clean aroma offers expressive red fruits. The palate is very fresh, accessible and medium-bodied. The aftertaste exhibits delicate aromatic lift as well as defining acidity and fine tannins. Attractive and precocious, but loose-knit and missing intensity. Moderately dense black red with purple rim. Very clean nose, focused and concentrated, with healthy black fruits and youthful reserve. The impression on the palate is again dominated by healthy fruit. Nearly full-bodied and balanced with excellent depth. Well-calibrated structure. This is classic in style and will keep. Dark red-purple, less than moderate density. Lifted red fruits with a peppery note. Clean and fresh, rather open. Not the typically impressive result from this benchmark estate. Slightly more than medium density, dark red with purple. Attractively pure, mature nose with carefully married red fruits, oak and spice notes. Precise and focused in the mouth. Particularly well-knit. Medium-bodied plus. Builds in intensity toward the finish. Elegant and well-defined with an accent of smoky oak in the final taste. A fine Poyferré. Moderately dense dark red with purple at rim. Clean aromatic impression. Toasted oak and wood spices at first, giving way to red fruits and berries. Medium-bodied, appealing, fresh and balanced. Short of moderately dense dark red with clear purple rim. Scented red fruits along with spice and pepper in the aroma. The attack is muted, then the wine reveals mature fruit and a sweet undertone. Talbot 2015 possesses a ripe structure and is attractively balanced. Offers precocious charm. Less than moderate density, dark red with purple rim. Lacking in expression, suggesting red fruit and oak. The taste is fresh, very dry, just medium weight. Misses concentration. Somewhat austere at the end. Just moderately dense dark red with clear purple rim. Expressive nose of nuanced red fruits, spice and a charred oak note. Focused and also harmonious on the palate. Medium-bodied with early complexity. Well-integrated fruit and oak. Fine well-calibrated structure. Medium density, dark red with purple rim. Relatively open nose of nuanced red fruit and oak. Clean, medium weight. Has a transparent mouth-feel. Stylish and elegant with a balanced structure. Moderately dense very dark red with purple. Clean, reserved aroma with youthful dark red fruit. Clean taste of healthy ripe fruit. Medium-bodied plus. Harmonious and especially well-knit. Promising young finish. A complete example and excellent result. Moderate density of color, dark red with purple. The aroma surprises with its lovely expressiveness characterized by a mix of red and black fruits and carefully married oak. The palate is equally attractive, offering purity and equilibrium. Has energy and follow-through with a defining backbone of acidity and tannin. A terrific 2014 from an outstanding property. Less than moderate density, dark red. Clean, fresh nose but not particularly concentrated. The palate follows and is medium-bodied and balanced. Expressive at this stage. Not the typical young Grand-Puy-Lacoste with long aging potential. Moderate density plus, black red with purple at rim. Clean, reserved to the nose. Hints of red and black fruits and new oak. The wine is layered and more expressive in the mouth. Medium- to full-bodied, Lynch-Bages gains in volume and is persistent and mouth-coating. Harmonious structure. A terrific 2014, with a distinctive Pauillac signature. Moderate density, dark red with clear purple at rim. Very clean nose, muted healthy red fruits and a creamy note. Poised, fresh, medium-bodied. Elevated acidity and medium tannin. Composed, but not the concentration or density of a great Lynch-Bages. Somewhat more than moderate density, very dark red with purple rim. Clean, healthy, young and reserved aroma with a background of red fruit and well-matched oak. Rather closed in its taste with considerable reserve. Red and black fruits at the core. Clean, dry frame. An excellent Pichon Baron for the medium term or longer. Moderately dense very dark red-purple. A fairly open nose of dark fruit and a leafy overtone. Clean, fresh taste. Well-balanced ripe structure. Attractively composed and harmonious, but not the concentration or dimension of the greatest vintages of Pichon Lalande.